Oct 06, 2015 (LBO) – Japan will provide a 45.4 billion Yen (380 million dollar) loan under a ‘Comprehensive Partnership’ arrangement that will include expansion of the Bandaranaike International Airport in Sri Lanka, the Japanese Foreign Ministry said. 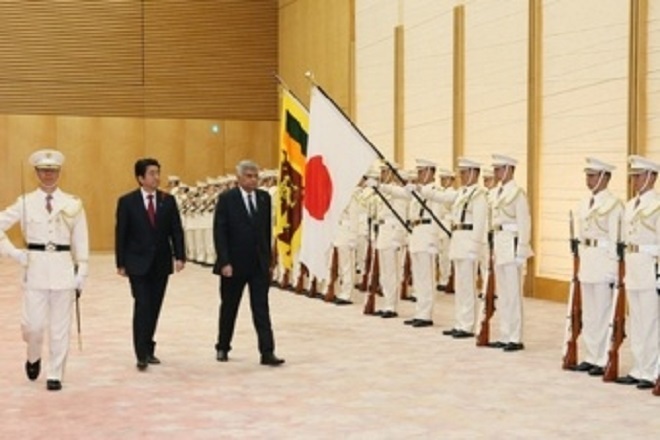 The agreement was announced during Prime Minister Ranil Wickremesinghe’s visit to Japan after meetings with Japanese Prime Minister Shinzo Abe. The two leaders decided to deepen cooperation through a ‘Comprehensive Partnership,’ a statement said. “Both leaders reaffirmed that the strengthening partnership between the two countries, which share the fundamental value of the rule of law and democracy, can contribute to prosperity of the two countries as well as the Pacific and Indian Ocean region,” a statement said. The partnership will emphasize investment and trade, cooperation on national development in Sri Lanka, and national reconciliation and peacebuilding. Sri Lanka is keen to increase bilateral and multilateral assistance this year due to a weakening of the balance of payments after a pull out by foreign investors from emerging markets tied to global uncertainty. projects such as expressways and the Urban Planning of the City of Kandy,” Wickremesinghe had stated. Japan will continue its cooperation in the field of electricity including the formulation of power generation and transmission master plan. The promotion of high efficiency coal-fired power generation will contribute to energy security and reduction of greenhouse gas emissions. The two countries will cooperate in the area of Clean Coal Technologies, the statement said. With regard to IT, hope was expressed that the Integrated Services Digital Broadcasting-Terrestrial (ISDB-T), a technical standard for digital television broadcast, will be adopted in Sri Lanka. Wickremesinghe said a fair and transparent selection process based on functional capability and feasibility is currently under way. Japanese Prime Minister Shinzo Abe also promised to support maritime security and to provide patrol ships. Japan will provide cooperation in the field of disaster risk reduction including conducting a survey, with a view to providing a meteorological radar system. Speaking to Japanese parliamentarians, the Prime Minister said Sri Lanka was seeking Japanese assistance in reconstruction and rehabilitation in the island. “Once again we are seeking Japanese assistance to summon a meeting of donors to assist in the reconstruction and revitalizing the socio-economy of conflict affected areas,” he said. Wickremesinghe promised that the new Government will create a more favorable investment climate, ensuring transparency and good governance in order to attract investment from Japanese companies, the statement sad. “The government is planning to carry out the next generation of reforms to make Sri Lanka a highly competitive economy,” he added.